On April 23, McLane held their 30th annual golf tournament on behalf of Children’s Miracle Network Hospitals. Vendors traveled from around the country to play golf, donate necessary funds and spend quality time with amazing miracle families. The three miracle kiddos pictured were treated at Baylor Scott & White McLane Children’s Medical Center in Temple, Texas. They were given some well-deserved love and attention from all who attended including: Miss America, Jason Witten and Randy White. 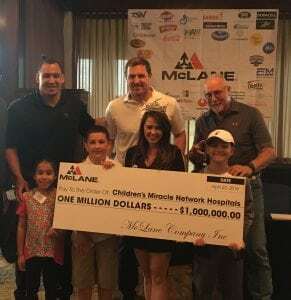 In addition to the focus on these great kids, McLane raised $1 million for Children’s Miracle Network Hospitals, officially becoming 2018-2019 Miracle Million Club members.